And by the way, you can put your knives away for her next performance. When “Repo! 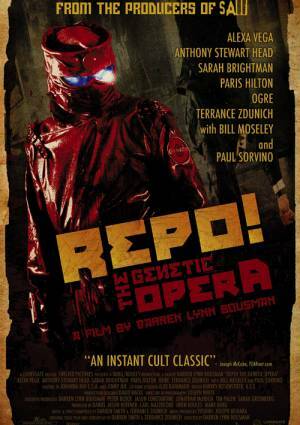 The Genetic Opera”“Repo! The Genetic Opera” comes out November 7, you just might have second thoughts about Hilton’s critically savaged big-screen presence. Light years better than she’s been in films like “House of Wax” and “The Hottie & the Nottie” (faint praise, we realize), Hilton stars as the plastic-surgery-addicted Amber Sweet. MTV caught up with Hilton and her “Repo” co-star Alexa Vega (all grown up after three “Spy Kids” films) moments before they took the stage at Comic-Con in support of their new film, a rock opera from the makers of “Saw.” MTV found a confident and relaxed Hilton, as excited about her forthcoming album and collaboration with boyfriend Benji MaddenBenji Madden as her new film. MTV: Is this the first Comic-Con for each of you? Paris, have you been here before? Paris Hilton: This is my first Comic-Con. I’m very excited. Alexa Vega: [Holding the microphone.] I feel like I’m interviewing her. [Laughs.] How was your “Repo” experience, Paris? Hilton: It was incredible because of you. MTV: This is not an easy sell of a movie. Was it tough to convince you to sign on? Hilton: I read the script and immediately fell in love with it. I’m a huge fan of [director] Darren [Lynn Bousman]. I love the “Saw”“Saw” films, so the fact that I was being offered a role like this — which is completely different and so different than me — I was just so excited to even get to be a part of it. I really worked my hardest. There were, like, 25 top actresses trying out for this part, and I got the part. MTV: Your character is addicted to plastic surgery. Where do you stand on that issue? Hilton: Well, I’ve never had any plastic surgery, so doing a character like that — it was a lot of fun to change because every scene I have a different nose, I have different eyes, different hair. We were using a lot of prosthetics, so every scene you can’t really tell that it’s me, so that was a lot of fun. MTV: Is this kind of a wish fulfillment? You know, there aren’t that many musicals nowadays, let alone something this inventive and this kind of cool, very interesting production design. Vega: I feel like this is so unique and so different. It’s not a musical, it’s not a horror film — it’s everything. It has a lot of depth and a lot of layers to it. I think that when people go to watch this film they’re going to be so overwhelmed. [To Paris] And then your performance on top of that, I think it’s going to shock a lot of people. It’s showing a lot of different sides of people, which I think will blow our audiences away.